Not use to seeing cattle behind the house. This morning was the first time in months that there wasn't 8 to 10+ deer at the feeder. I sure like seeing the cows fat and happy, at least to my standards. 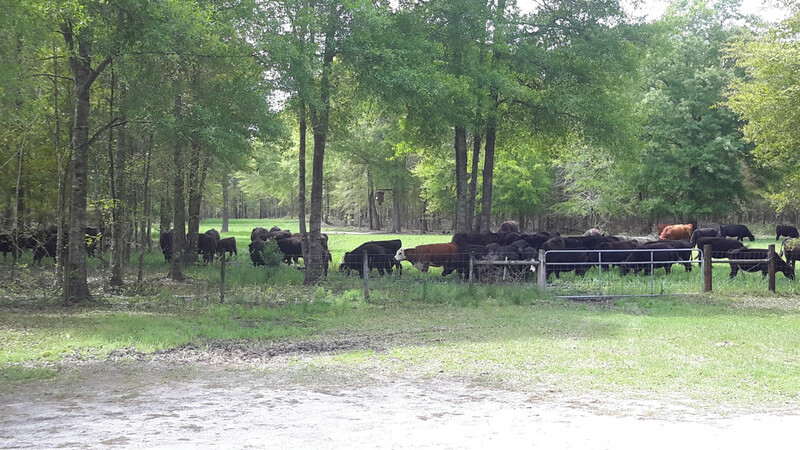 Re: Not use to seeing cattle behind the house. Happy cattle, green leaves, green grass.... doesn't get any better than that. I have to admit to being a little envious. Silver, there was 3 gobblers strutting their stuff to a couple of hens Tuesday morning at that feeder. I've heard the gobblers the last few mornings but haven't seen them. Need me to come help you find them? Anytime you want your more than welcome. We're having our GCA convention and trade show at the state fair grounds in Perry, come on by. Lots of nice chutes on display that you can try out, probably 6+ different brands. Been trying to find a good chute for 5 years. Was fixing to buy new. Found a good used Priefert last night on CL above Atlanta. Didn’t want to make that trip. Got on UShip and got it delivered to my house for $250. 177 miles. Driver just unhooked it about 10 min ago. Beats the heck out of that traffic and it would have killed a whole day. So it turns out it actually does "get better than that" and I'm a lot envious. Back off! That was addressed to me! That's a great sight to wake up to. Cattle look good, fat and sassy!